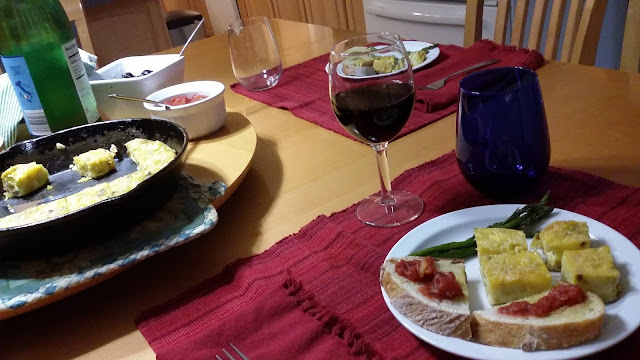 While my hubby and I were in Spain, we had Spanish omelets on a couple occasions. The first night we were in Spain, we found ourselves at a little bar that was kind of like a fast food restaurant. They had amazing prices, which was great after the expensive food in Switzerland! At the place in Spain, you could get a glass of wine for $1,50 Euros and the little appetizers and snacks were only $1,0 or $2,0 Euros. 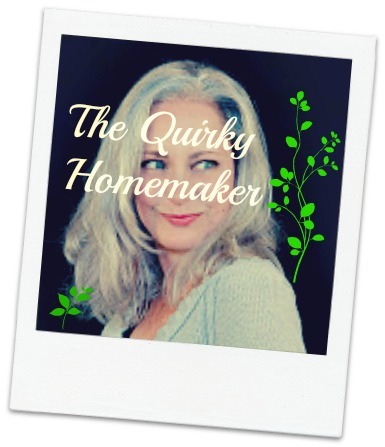 That night I got a dish of olives and a Spanish omelet sandwich. . . and chips and salsa. I was determined to eat as many olives in Europe as possible, but that's not we're talking about right now! The Spanish omelet that we had in the Catalunya region was diced potatoes in cooked egg, which was then cut into little squares. I had the Spanish omelet again one day for breakfast at a little sidewalk cafe. That time the Spanish omelet was served with little pieces of crusty bread with tomatoes on top. I was very pleased with my little meal! 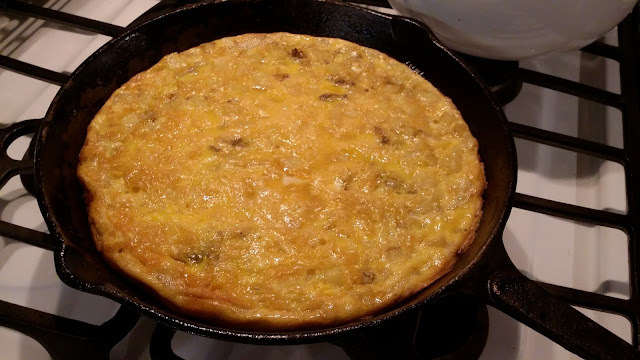 I tried to recreate a Spanish omelet and the bread for my kids for dinner last night. Since my kids aren't huge onion fans, this omelet is pretty basic. And truthfully, I don't remember there being onions in my omelet in Spain. The fact that it's basic makes it pretty darn easy. We try to keep potatoes in our kitchen pantry and eggs in the fridge, so we had all the basic ingredients. 2 Tbsp. Olive Oil~~ If you can get your hands on some European Olive Oil, even better! Heat 2 Tbsp. Olive Oil over medium high heat in a cast iron skillet until it runs easily and covers the bottom of the skillet. Turn burner to low, add potatoes and cook potatoes on low, stirring occasionally until the potatoes are tender~~ about 10 minutes. Test the potatoes to see if they're as soft as you like. Sprinkle the paprika, salt, pepper and onion powder over potatoes and stir to mix throughout. 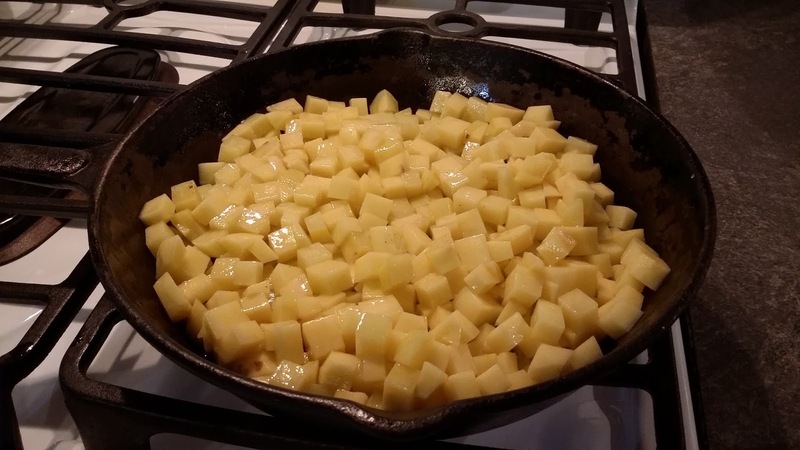 Remove potatoes to a bowl, scraping all the potato pieces off the skillet. Whisk eggs together with 1/2 tsp. salt. Add 1 Tablespoon olive oil to skillet and heat over medium heat until warm. Combine eggs with potatoes and stir. Pour egg potato mixture into skillet and give it a swirl to evenly distribute the potatoes. Heat over medium heat about 2 minutes until the sides are slightly set. Move the skillet to the preheated oven and cook for 20 minutes, or until all egg is cooked through. Test it with a cake tester or toothpick. All ovens vary, so you can check yours at 15 minutes if you wish. Let the omelet cool while you prepare the bread. Half a loaf of French bread and enough olive oil to brush onto the slices of bread. Can of Fire Roasted Diced Tomatoes ~~ Petite diced tomatoes would be better, but I couldn't find them. Cook in the preheated oven for about 10 minutes. Let each person spoon diced tomatoes onto their bread if they wish. After the bread is done, cut the Spanish omelet into little squares and put 4 - 5 squares on each person's plate. 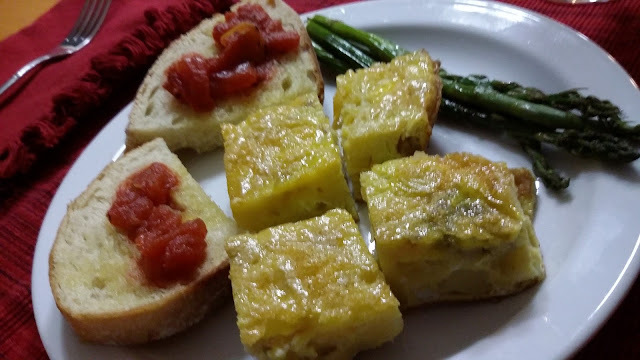 We served our Spanish omelet and Crusty bread with roasted asparagus and sparkling mineral water. The kids were NOT a fan of the sparkling mineral water! More for me. I also spiced up some plain black olives and manzanilla olives with a drizzle of olive oil, the juice from half a lemon, 2 minced cloves of garlic, some black pepper and crushed red pepper flakes. I put those in a little bowl on the table, along with a bread basket and the leftover asparagus and omelet so that we could easily get more. Our kitchen was transformed into a sidewalk cafe in Spain. 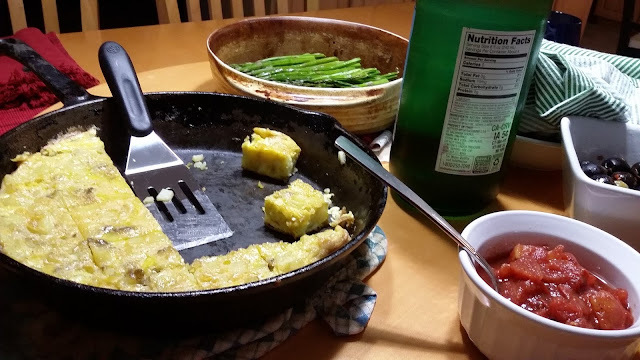 My kids really liked the Spanish-style omelet and got seconds. I believe they would like me to make it again. It was a fun, easy way to show them how we ate while we were in Europe. Have you ever had a Spanish omelet cooked this way? Update: We've made these Spanish omelets no less than once a week since making them the first time! 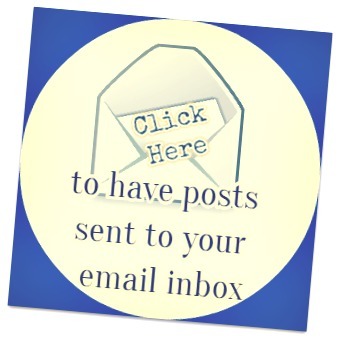 We LOVE this recipe in our kitchen!